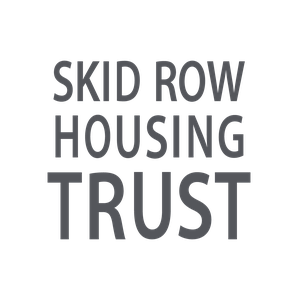 Skid Row Housing Trust is a nationally-recognized non-profit organization based in Downtown Los Angeles that develops and operates permanent supportive housing for individuals who have experienced homelessness, prolonged extreme poverty, poor health, disabilities, mental illness and/or addiction so that they can lead safe, stable lives in wellness. Permanent supportive housing is affordable, community-based housing designed for individuals who need long-term housing assistance combined with critical supportive services. These individuals are often chronically homeless and face persistent obstacles to maintain their housing, such as mental illness, chronic medical conditions, substance abuse, and/or domestic violence. Over its 27-year history, the Trust has grown to become one of the largest permanent supportive housing providers in Southern California, with 26 properties offering 1,848 safe and healthy apartment homes to formerly homeless and low-income adults in the City of Los Angeles. The Trust practices “Housing First,” a successful, evidence-based approach that quickly houses homeless individuals and then offers them voluntary supportive services and connections to the community-based support they need to keep their housing, improve their health, and avoid returning to homelessness. The Trust operates an integrated services model in partnership with a number of collaborating agencies to provide mental healthcare, medical care, occupational therapy, benefits advocacy and other services – many on site at the Trust’s buildings – that allow residents to thrive in their new homes and communities. By successfully maintaining their housing, the Trust’s residents break their cycle of homelessness, reduce their rates of emergency room visits and recidivism, and are able to address underlying conditions that threaten their housing stability – outcomes that save lives and save public systems millions of dollars.